Here you will find the most recent recordings by Winston and Juanita. 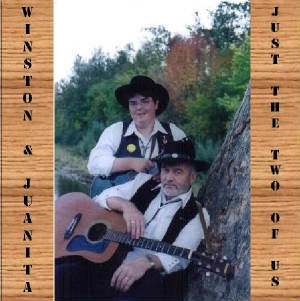 Just the Two of Us is Winston & Juanita's debut production. It contains the unique sound of Winston and Juanita because there are no back up musicians or sound effects. It was recorded at the Smith's Creek Hall using only their sound equipment and Juanita's computer. This production contains 24 selections - 16 songs, 4 fiddle tunes, 3 banjo tunes and 1 mandolin tune. To see the list of tracks and to hear a few samples please click on the picture. PRICE: CDs and Tapes are both available for $15.00 - remember these are 60 minutes NOT 30 minutes like most productions. To inquire about ordering a copy please e-mail Winston & Juanita or see the Contact Information page. Copyright 1997-2006 Winston & Juanita.